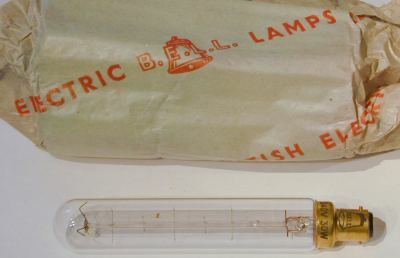 Tubular light bulb made by British Electric Lamps Ltd. Their name is on the lamp as BELL and on the wrapper as B.E.L.L. Rated at 240v 30w and with a SBC base. The length of this bulb resulted in an attractive range of supports. At the top of the glass rod are 3 rods to keep the rod stable under vibration. The coiled tungsten filament zig-zags over 15 supports. The bulb is 15cm long. 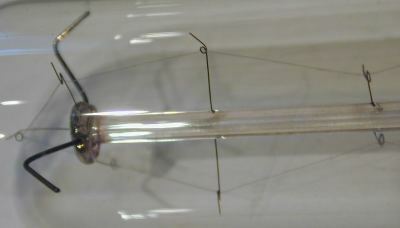 The single coiled tungsten filament used here was developed by GEC (US) in 1913 to counteract heat loss due to traces of water vapour. Nitrogen gas filling was introduced at the same time and for the same reason. By 1914 most manufacturers used gas filling and coiled tungsten. This bulb was probably made in the 1930's but could be a little earlier. Wrapping is corrugated card and paper with the company name printed on it.